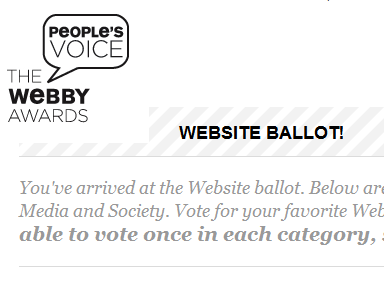 If so, you better get along to the Webby Awards site and start voting. Currently Vox are trailing behind Digg (40%) and Facebook (32%). Vox is only on 10% of the vote. Looks like it could do with some dedicated assistance from everyone else on Vox. Vote for Vox by following this link. After you register or log in, click on Website, Connections, and then Social Networking. The deadline to vote is April 27th! Registration is quick and painless, and then you can cast your vote and not think about it again. So take a second to follow the link and give Vox a good boost up!